Køb mindst 3 og få den til 119,38 pr. stk. 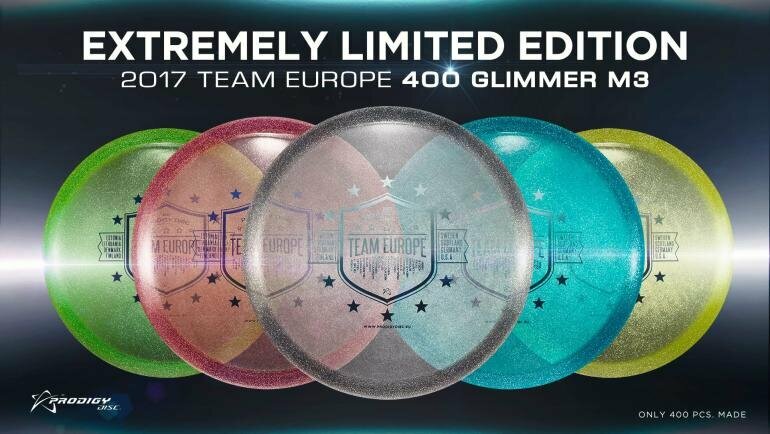 We are really excited to release these Special Edition 400 Glimmer M3s June 21st, 2017! There are only 400 of these beauties in existence so make sure to act fast if you want one! The all new 400 Glimmer plastic is just as durable and feels just like the normal 400 plastic but also it features eye-catching Glimmer specks molded into the plastic. The sweet custom stamp holds the names of all of our team players and the countries they represent. M3 er en meget pålidelig midrange driver, designet til at være stabil for spillere med moderat power, og for spillere som har behov for en disc som har et pålideligt fade og god kontrol. M3 is an extremely reliable mid range driver, designed to be stable for moderate power throwers and for players who need a disc that will finish left (right handed throwers) with incredible consistency and control. The M3 mid range is good for all conditions and flies well in all wind conditions. The consistent flight path of this disc makes it a favorite of the top rated players in the world. The M3 features the trademark Easy Release Technology. Let understabil midrange til de lange bløde anhyzers. En pålidelig og kontrollabel midrange disc. Ny X5 - First Run. Frigives til salg d. 18. Juli 2017! PA2 er til putt og indspil. Den er designet til at være stabil til overstabil i alle vindforhold. Aviar3 har det samme gode greb som den udødelige aviar, men med en helt flad top. Fundraiser disc fra Ledgestone Insurance Open 2016. Disc&#039;en kan lyse i mørke. The Discraft Zone is a stable to overstable putter/midrange with a low profile feel in the hand. NYHED!All-Terrain Rain Fly, sort. Lad dig ikke stoppe af en smule regn!Don’t let a little rain dampen your day—protect your gear from the elements.